Phil has lived locally with his spouse Annie Nielsen in the Parramatta area for 22 years and has two daughters. Phil has been a professional civil engineer, TAFE head teacher, and an officer of the NSW Teachers’ Federation, working for better conditions for students and employees. He still campaigns to “Defend TAFE”. 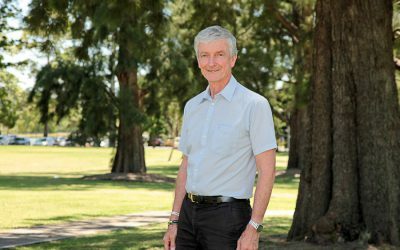 Phil won a National Volunteer Award for his leadership roles in the Parramatta climate action network (ParraCAN) and Parramatta Female Factory Friends heritage group, and as president of Reconciliation for Western Sydney for nearly 20 years. He also volunteers with Parramatta Bushcare and the Better Planning Network. As a Councillor, Phil will continue to advocate strongly for Parramatta’s green spaces, amazing heritage sites, for communities opposing overdevelopment, for renters’ rights, affordable housing, more local clean energy jobs, the arts and quality Council-run affordable childcare.